HTTP link represents website address. If you need to convert HTTP link to PDF file, first you should Click or Ctrl+Click to follow the link to open web page. In another word, convert HTTP link means to convert the corresponding web page to PDF. 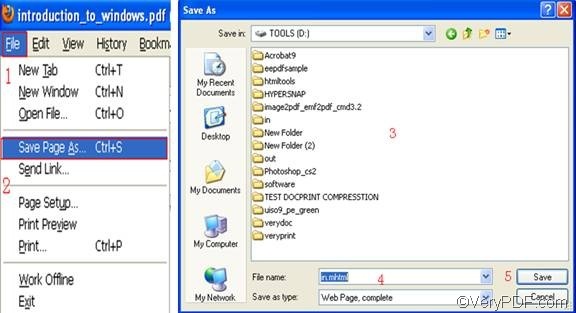 The following will introduce how to use the command line application of VeryPDF HTML Converter to set PDF producer as convert HTTP link to PDF. It requires five steps. You should begin with install the VeryPDF HTML Converter command line application in your computer. You can download the command line application by clicking VeryPDF HTML Converter Command Line. To buy it, please click Purchase. Then it will take several seconds to install the command line version of VeryPDF HTML Converter. Click or Ctrl+Click to follow the HTTP link to open web page, then you can save the web page as HTML format in the following way: click the “File” on the tool bar; > select “Save Page As”; > When the “Save as” dialog box appears, select a directory in the list box; > enter the full file name including the file extension like HTML in the “File name” edit box. > Click the “Save” button. For example, this article saves the web page on disk D and named it in.html. Now you can type a command line in the command prompt window. You should pay attention that the command line must consist of four essential items: the directory of the executable file, the command which can be set PDF producer, the directory of the input file and the directory of the output file. The command should be -producer <string>. The angle brackets are often used to enclose essential contents. string refers to character string, which is always enclosed by quotation marks “” when appears in a command line. For instance, the following command line can be used to set “pdf producer” as PDF producer and convert HTTP link to PDF. You can substitute the directories of corresponding files in your computer for the directories in the example. You can also change the character string following the command. -producer "pdf producer" ---- the command that can be used to set "pdf producer" (without quotation marks) as the PDF producer. D:\in.html ---- represents the HTTP link which has been saved as the format HTML and named in on disk D.
C:\out.pdf ---- represents the PDF file named out on disk C.
The computer is supposed to convert HTTP link to PDF as soon as you press the key. Meanwhile, you can view the process information in the command prompt window. Once you find “result =OK” in the command prompt window, that means the job is done. Then you can check the PDF producer in the “Properties” dialog box of the PDF file. This entry was posted in HTML Converter (htmltools) and tagged command line, HTTP link to PDF, set pdf producer. Bookmark the permalink.